I’m not really sure that’s how German people who donated to the German Red Cross for the disaster relief for the March 11 earthquake/tsunami wanted the money to be spent. The library and the nursery school are for people evacuated from Kawauchi-mura in a planned evacuation zone to Koriyama City. Koriyama City is in high-radiation “nakadori” (middle third) of Fukushima Prefecture, where pre-schoolers were found with 0.11 millisievert external radiation in one month in November 2011, with the maximum 0.66 millisievert. Certainly not a place where any nursery school should be. But the donation from Germany was used to build a facility to keep the villagers from Kawauchi-mura in Koriyama City together. A facility with the library room and the nursery school opened on January 6 in the temporary housing in Koriyama City in Fukushima Prefecture where the residents from Kawauchi-mura lives after having evacuated from their home after the nuclear accident. 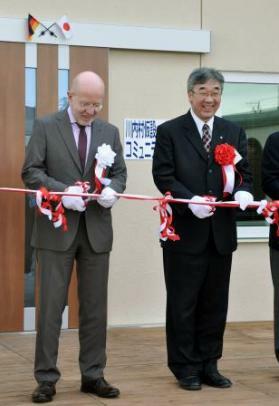 The facility was built with the money of about 40 million yen (about 408,000 euro, US$520,000) donated via the German Red Cross. The village wanted a place where the residents could mix, and the Germany side wanted to provide a support that could symbolize the friendship between Japan and Germany. The facility is a single-story wooden building of about 265 square meters. It will be managed by the village’s Board of Education, and will be used as the nursery school, the tutoring school, and a place for health consultation for the residents. When the villagers go back to Kawauchi-mura, the facility will be dismantled and brought to the village. The happy result that satisfied both the village people and the German Red Cross was to build a “box” (hakomono in Japanese, a construction project) that will be managed, of all entities, by the Board of Education. Ever since the nuclear accident started in March 11, 2011, the Board of Education in many cities and prefectures in Japan has done everything in their power to expose children to radiation – having them eat beef and drink milk with radioactive cesium,making them harvest green tea in the rain, making them gargle with green tea, making them clean the yard of dead leaves and sludge, taking them to summer schools in the high radiation areas in northern Kanto. Of nuclear experts, only Professor Kunihiko Takeda of Chubu University spoke against these school “traditions” mindlessly carried out all over Japan.